Give a gift that supports nature and provides year-round options for the recipient. 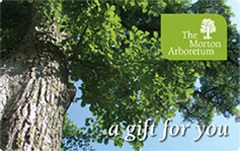 Give The Morton Arboretum Gift Card. Perfect for birthdays, graduations, weddings, anniversaries or any special occasion. Arboretum gift cards can be used for The Arboretum Store, The Arboretum Store web site, The Ginkgo Restaurant and Cafe, Gift Memberships, Memberships,Education Classes, Workshops, and Symposia, Theatre Hike Tickets, Chamber Concert Tickets, Admission, Tram Tours, Breakfast with the Bunny, Easter Brunch, Mother's Day Brunch, Breakfast with Santa, and more! Please note that shipping costs for gift cards $50 and under is a minimum of $7.50 for standard Priority Mail via USPS. Expedited shipping costs will be more and will be based on zip code, selected shipping option and is calculated based on direct shipping costs via UPS. Since gift cards are considered 'cash', shipping charges for gift cards include insurance. If a gift card purchase is being shipped with other store merchandise, then UPS rates will apply and will be based on zip code, package weight, and selected shipping option. Gift cards in different denominations are available by contacting The Arboretum Store directly at #630-719-2454 during normal business hours. The same shipping rates apply.